It's sort of a sad thing to report, but after moving to NM in 1993, I seem to spend more time close to home than out investigating all the beauty that surrounds us. 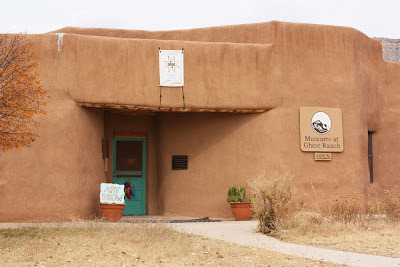 I knew far more about Santa Fe when I lived in San Diego, and rarely go there now except to drive through on the way to the airport. Shame, shame. Thursday was different, I'm happy to report. I volunteered to travel out to Georgia O'Keefe country to pick up some weavings for my friend Debra, who lives in Arkansas but belongs to a local weaving cooperative. It was a blast from the past. Once or twice I had my own pieces hanging in that same museum, many, many years ago, and I had forgotten what an excellent venue it is. There are no colors or weavings that don't look absolutely spectacular against those old, adobe walls. I took lots of photos to share with you. It was a rather dreary day, but you'll get the idea, if you have never been before...or a tickle to your memory if you have. Old Georgia was one smart cookie...she knew a great place when she found one. We were trying to imagine what it must have been like (how isolated) in the days when she lived there (it was her summer home), without all the tourists and fancy roads. 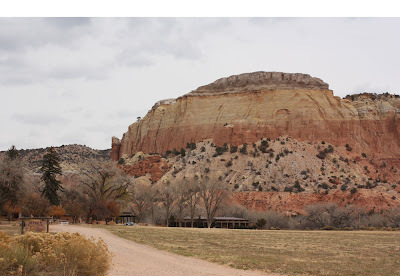 Today, the Ghost Ranch is a retreat center and I imagine their website must have listings of classes if you are interested. 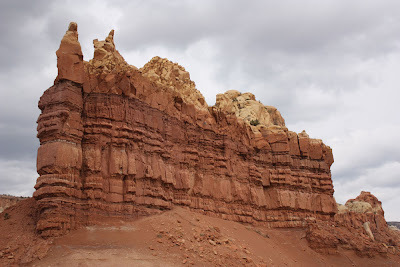 Martie -- the pictures of Ghost Ranch brought back memories of our trip last month to New Mexico. We spent a little time in Ghost Ranch and did a hike up into Box Canyon -- where a big rattler crossed in front of us. It's a beautiful place. What a beautiful location Martie. Thanks for sharing the photos with us. Oh thanks for the pics! 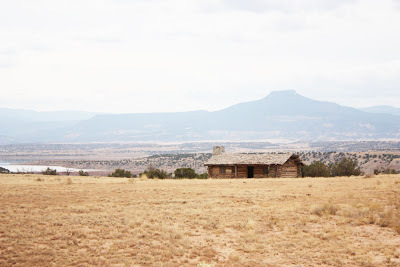 We haven't made it out to the Ghost Ranch yet. Hope to at some point. I didn't realize her place was tucked up next to those red rocks. Magic. Wonder what that was like during a rare heavy rainfall? Yeah for finding the time to get out there and enjoy your territory. Excuse me, is your pig missing?